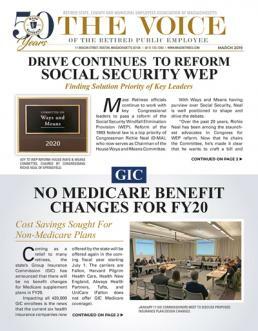 Beyond the national importance of Social Security policy, are the Windfall Elimination Provision (WEP) and the Government Pension Offset (GPO), two issues also falling under Kerryâ€™s legislative jurisdiction. Kerry, who supports the Associationâ€™s efforts to repeal both the WEP and GPO, has yet to publicly state his planned hearing schedule for the Committee. With the key Senate bill (S206), which calls for a full repeal of both laws, expected to be heard before the Subcommittee on Social Security later this year, it is the Associationâ€™s hope that Senator Kerry will quickly schedule a public hearing to bring further attention to this important issue. Kerry was an early backer this year of S206, which was filed by California Senator Diane Feinstein. â€œWe have asked Senator Kerry to schedule a full hearing on the GPO and WEP. This is an important issue to our members, one that is literally costing retireesâ€™ thousands of dollars a year in lost income,â€ said Association President Ralph White. â€œNot only do these two misguided laws harm public retirees, but the lost income also hurts the stateâ€™s economy. â€œI believe the Senator understands this issue and supports our efforts for a full repeal. And, it continues to be important for our members, throughout the country, to contact their US Senators and urge them to fight hard in support of S206.â€ As of press time, thirty US Senators, including Ted Kennedy and presidential candidate Barack Obama (D-IL), have signed onto S206 as co-sponsors. Support in the US House of Representatives for the repeal of the WEP/GPO has now surpassed a veto proof two-thirds majority, with 308 of the 435 Congressmen supporting H.R. 82. The bill, filed by California Democrat Howard Berman and Republican Howard â€œBuckâ€ McKeon, mirrors the Senateâ€™s S206 in fully repealing both the WEP, as well as the GPO. While H.R. 82 is currently pending before the House Subcommittee on Social Security, which is chaired by Congressman Michael McNulty (D-NY), no hearing date has been established. No MA congressmen are members of this subcommittee. Over the past five years, when the House was under Republican control, several hearings were held on the issues of WEP, GPO, and overall Social Security reform. However, the Republican Congressional Leadership blocked any attempt to report or discharge a bill from the Committee. Members will note that Massachusetts is one of seven states (CA, CO, IL, LA, MA, OH, TX), where the majority of public employees do not participate in Social Security. Certain segments of public employees, in as many as twenty-eight states, also do not participate in Social Security and are, therefore, subject to the WEP and GPO. In order to be impacted by the GPO (collecting Social Security through a spouse), a retiree would first become eligible to retiree after July 1, 1983. The WEP (collecting Social Security on oneâ€™s own work history) impacts those who were not eligible to retire by January 1, 1986. Eligibility to retire is determined by one of two factors: Achieving twenty years of creditable service, regardless of age; or be at least 55 years old with ten years of creditable service. Virtually all new retirees and those, who will retire in the future, have been or will be impacted by the WEP/GPO.